Congratulations to you Mr. Scott Kelly . 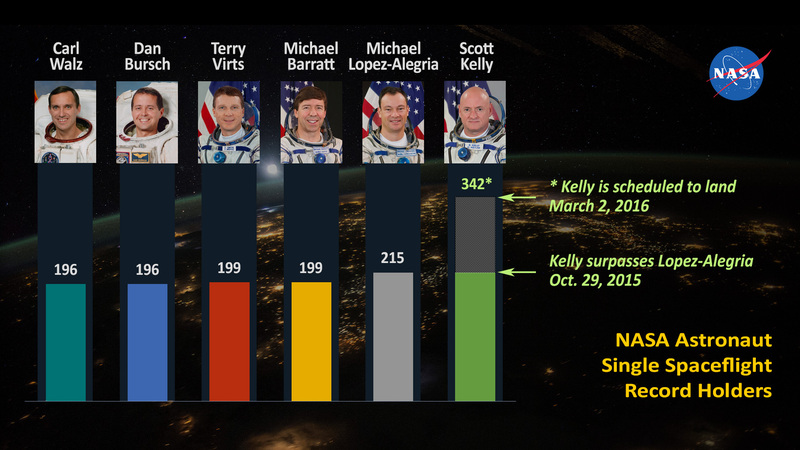 Well done Mr. Scott Kelly by exceeding Mr. Michael Lopez-Alegria’s record of 215 days on a single spaceflight and you passed Michael Fincke’s record of 382 cumulative days in space on Oct. 16. This is a huge moment for the program that I feel didn’t really get the attention it deserves, and Scott still has more time up there! The amount of research and technological developments required to keep a living human in space that long is remarkable, but what the developments will do for life here on earth is completely intriguing. It is common fact that many of the things we couldn’t live without, like my smartphone, find their roots in space programs and I’m excited to see what technologies will be the product of the year in space! it’s important to remember that while it’s cool that a record was broke, breaking the record was never the point of the mission.